When: Dinner is 5 p.m. to 6 p.m. on the second Monday of each month; and lunch, 11:30 a.m. to 12:30 p.m. on the fourth Monday of the month. Where: St. John’s Lutheran Church, at 223 S. Hallett St., Medical Lake. Groceries: Free groceries are distributed starting at 4:15 before the monthly dinner begins. 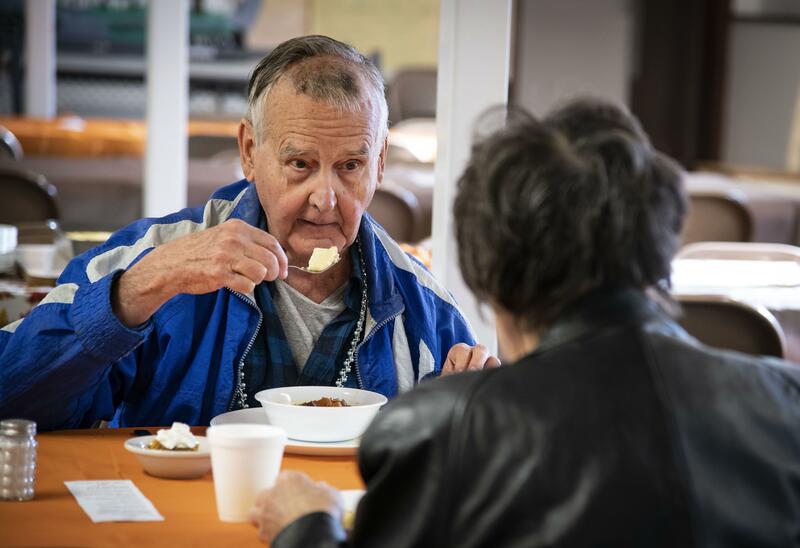 The warm smell of food filled the basement of St. John’s Lutheran Church in Medical Lake on Monday as people turned out for Feed Medical Lake’s monthly lunch. The nonprofit organization was founded seven years ago by church member Joanna Williams. “It is a ministry of the church,” she said. Tom Durst got a bowl of soup and some cornbread before sitting with his friend Pat Jones. He said he’s been coming to the meals for five years and credits the program with persuading him to move to Medical Lake. Food is donated to Feed Medical Lake by several local organizations, including Second Harvest and Northwest Harvest. Feed Medical Lake serves dinner at St. John’s, located at 223 S. Hallett St., from 5 to 6 p.m. on the second Monday of each month and lunch from 11:30 a.m. to 12:30 p.m. on the fourth Monday of the month. People can also get free groceries before the monthly dinner beginning at 4:15 p.m.
Dinner is the largest of the two, attracting around 100 people compared to the 15 or 20 who come to lunch. There are door prizes and crafts for kids at the dinner as well. About two dozen volunteers help put the meals on. Williams said she loves the feel of the monthly lunches with the more intimate numbers. “Boy have we gotten to know each other,” she said. Williams said she knows there’s a need for her program in the community. The program has served 972 meals so far this year and given out more than 11,800 pounds of food. People are not required to show proof of income but Williams does ask for their name, phone number, ethnicity and what age range they fall in. Williams said she needs the demographic information for grant applications and needs the name and phone number in case any of the food served or handed out is recalled. “We do get recalls from Second Harvest,” she said. The program often operates on a shoestring. Williams said she has about $400 on hand right now because she recently had to replace a failing refrigerator. But since most of their food is donated the organization can make that cash last for a couple months. But Williams said she would like to buy extra shelves for the new refrigerator that cost $125 each. She plans to set aside some of the money raised at an upcoming fundraiser for that purpose. The organization will put on a bake sale at Denny’s Harvest Foods in Medical Lake from 11 a.m. to 6 p.m. Nov. 16 and 11 a.m. to 4 p.m. on Nov. 17. Published: Oct. 25, 2018, 6 a.m.